Go over current and forecasted tuition charges for Brown Mackie College - Fort Wayne, as well as just how these expenses contrast to the U.S. average. Prepare yourself economically for your college degree. Contrast Brown Mackie College - Fort Wayne's tuition charges to U.S. universities and colleges. Look for tuition trends and potential increases to see if you should expect to set aside more money for the following 4 years of tuition. How do Tuition & Fees at Brown Mackie College - Fort Wayne Measure Up To Other Colleges? The following table shows how Brown Mackie College - Fort Wayne compares to other colleges nationally, regionally and by state. How Much Does Brown Mackie College - Fort Wayne Charge for Tuition? Full-time undergraduates at Brown Mackie College - Fort Wayne were charged $12,492 in tuition and fees in the 2017 - 2018 school year, prior to adjustments for financial aid. Of this amount, the price tag on tuition totaled $11,592. $900 was the price of fees. In contrast to state schools, Brown Mackie College - Fort Wayne doesn't offer a tuition reduction to students who live in state. Tuition and fees at Brown Mackie College - Fort Wayne have remained stable in the past 5 years. We predict the price tag on tuition and fees for this year will be $12,403. If costs continue to remain stable, two years here will cost you $24,719 and four years will cost you $49,087. In addition, you may have extra expenses such as room and board, transportation, and books. 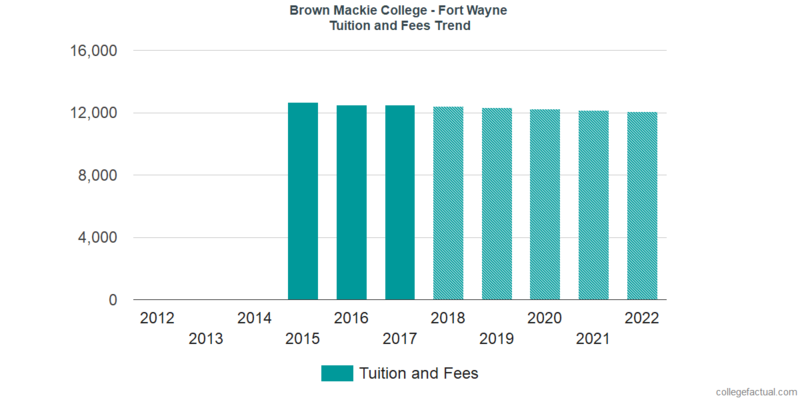 The following chart shows estimated future tuition and fees for undergraduate students at Brown Mackie College - Fort Wayne. Take note of just how much the tuition and fees are increasing each year. At a lot of colleges students will wind up spending more money on their last year of school compared to what they did for their first. Get your financial questions on college answered in our tuition & fees FAQ.